Barrow & Grimm Celebrate 40 Years! 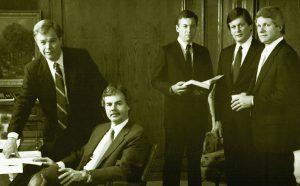 In December 1976 four young attorneys – Allen E. Barrow, Jr., Robert W. Gaddis, David W. Griffith and William R. Grimm – decided to form a law firm specializing in business related matters originally incorporated under the name of Barrow Gaddis & Griffith. With some careful planning and caution to the winds, they announced the opening of their law firm at 1600 Philtower Building on March 7, 1977. In addition, retired Tulsa County District Court Judge Oras A. Shaw joined the firm as senior counsel to add a touch of judicious maturity to the group. Within a few months, the name was changed to Barrow Gaddis Griffith & Grimm and a fifth young lawyer – William E. Farrior – newly graduated from SMU with an LLM in Taxation joined the firm. Over the next several years the law firm gained a reputation for providing sound legal advice to the Tulsa business community. However, with the growth in operations the law firm outgrew its Philtower office space with the additions of William Brad Heckenkemper, from the Oklahoma Attorney General’s office, and Nancy C. Pruitt. Cramped for space and no place to grow in November 1981, the five partners, together with several of their banking and real estate clients, created Main Plaza Associates, Ltd to purchase two buildings and a parking lot at 6th & Main Street. The law firm moved into its new office location in the spring of 1982 and resumed operations in the Main Plaza buildings for the next twenty-five years. In 2001 two partners retired and the law firm changed its name to Barrow & Grimm, PC. The Main Plaza buildings and parking lot were sold in November 2004, but the law firm remained as a tenant for a brief period. In 2006, the law firm doubled in size with the addition seven lawyers joining their practices from three different Tulsa law firms and once again the law firm was operating in cramped quarters. On February 1, 2008, Barrow & Grimm, PC moved to the 9th Floor of the office building at 110 W. 7th Street, where it operates today with twenty-seven lawyers and an office staff of sixteen legal assistants and general staff members. For over forty years, Barrow & Grimm, PC has been one of Tulsa’s finest law firms for individuals, entrepreneurs and businesses seeking legal advice for their important matters. The attorneys and staff of Barrow & Grimm, PC wish to extend their heart-felt “thank you” to the innumerable clients, business organizations, colleagues and friends who have made our successful longevity possible.